Science touches everyone on this planet. Closer to home, California ranks first in National Institutes of Health (NIH) funding by state and local life science companies generate $317 billion in annual economic output to support more than 1.1 million jobs. San Diego is the third largest life science region in the country. Science needs advocates. Policy needs scientists. As part of the UC San Diego School of Global Policy and Strategy’s (GPS) 30th anniversary celebration, the school is featuring events that examine the fusing of technology and policy. 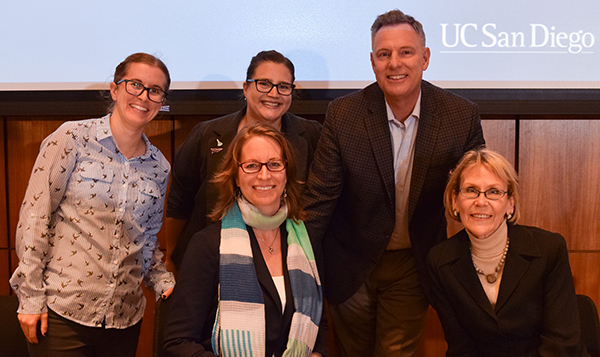 "The GPS Science Policy Fellows program promotes a multidisciplinary perspective in an effort to create well-informed responses to today’s global challenges," said Dean Peter Cowhey, who moderated the sold-out event. 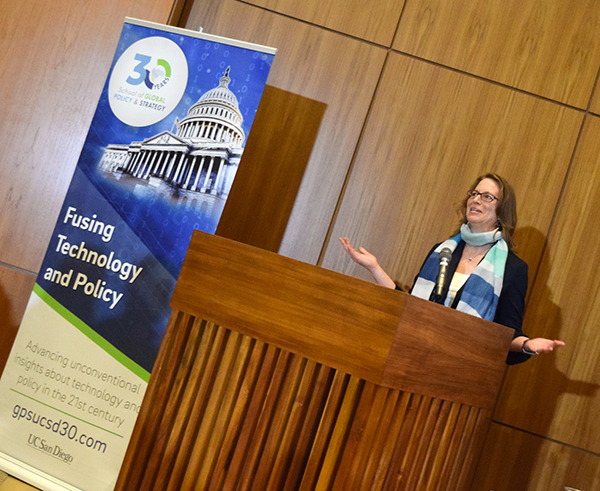 “We felt it is important to bring together changemakers impacting today's science policy outcomes for our 30th celebration." Building ties across campus, the GPS Science Policy Fellows program helps break down barriers between UC San Diego’s disciplines, and fuses policy into the STEM disciplines the campus is well-known for. On Oct. 30, policy and science met in an impactful panel discussion, as scientists and policymakers together examined the connections, the challenges and the critical collaboration between the two. The first panelists addressed the need for policymakers and elected officials to share their science platform during campaigns. 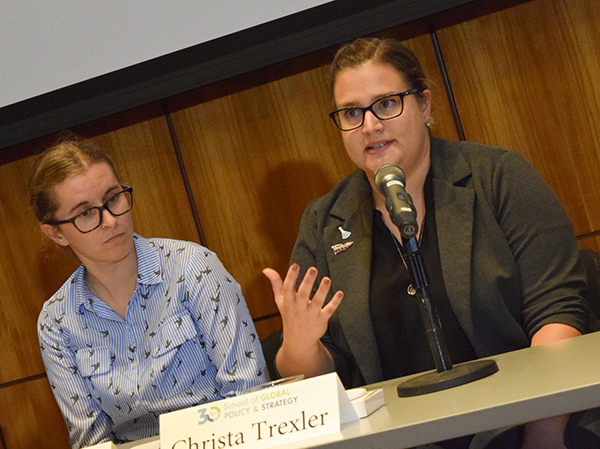 UC San Diego postdoctoral fellow Christa Trexler and aerospace engineer Allison Hutching highlighted the work of 500 Women Scientists and their own San Diego pod, where they lead the fight for equality and inclusivity. Led by Hutchings and Trexler, the San Diego pod headed the creation of a science policy voter guide, based on questions important to members and the community at large. As part of their “Get Out the Vote” initiative, they hope to use the language of science to bridge divides and enhance global diplomacy, sending out the questions to all candidates running either for U.S. Congress or state appointments in Senate, Assembly or Governor’s office. The guide will highlight policy dialogue in six key areas: harassment, inclusivity, environmental stewardship, immigration/family separations, dreamers and scientific integrity. To view the guides or get involved, visit their website. Amber Mace, Interim Executive Director for the California Council on Science and Technology (CCST), stressed the importance of trust and communication in policymaking. A former scientist and policymaker, her staff offers a multidisciplinary approach, serving as connectors and translators to both sides. Modeled after the National Academies of Sciences, Engineering, and Medicine, CCST was created to provide the State of California with a parallel network of institutional and individual advisors. Partnering with a network of public and private higher-education institutions and federally funded research institutions, the organization acts as an independent source of science for state decision-making. When asked how science can make the most impact on policy outcomes, the answers were clear. Supporting science is essential, not only for scientific advancements, but for our entire economy. Relationships matter. 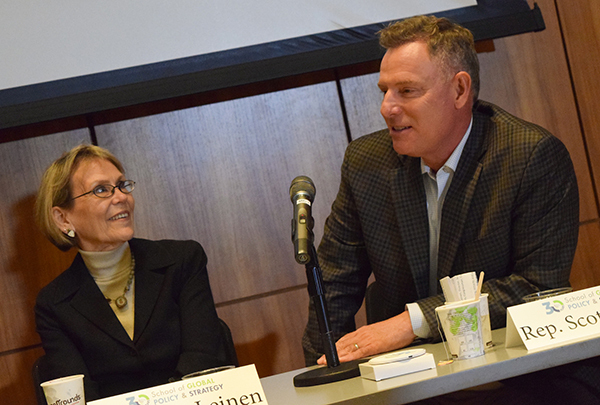 Speaking to a room of budding scientists, Congressman Scott Peters is a strong advocate for the investment in sciences, keeping a special eye on the concerns of San Diego as a former environmental lawyer and member of the Energy and Commerce Committee. Stressing the importance of having relationships with your local leaders, Peters encouraged participants to talk locally and staying on the pulse of the ever-changing science ecosystem. As the former assistant director for Geosciences and Coordinator of Environmental Research and Education at the National Science Foundation (NSF), Scripps Director Margaret Leinen is an expert in getting her voice heard in Congress and federal research administrations. Explaining the inertia in our government, she underlined the weight of two-way dialogue when setting priorities. All of government is looking for leadership and for good ideas. Leinen also highlighted the value of professional societies and fellowships, as the halls of Congress are populated with former interns. As valuable experts in the field, it was the recommendations and connections that have proven the most vital in her work. “You are the future and we want to hear from you. Don’t be afraid to speak up and to push your ideas forward. Every great project in your field came from somebody like you,” said Leinen. “Stick with it and don’t lose that vision. It is the science itself as well as the people that speak to policy. View a photo gallery of the 2018 roundtable here.